Is your preschooler watching too much TV? 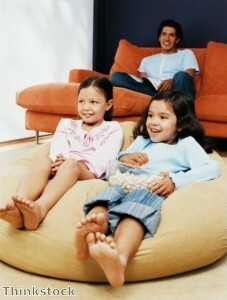 Home » Dad » Is your preschooler watching too much TV? New research being published in The Journal of Pediatrics has found that 66 percent of preschoolers are watching more TV than they should, both at home and while at daycare. Researchers from Seattle Children's Research Institute and the University of Washington studied nearly 9,000 preschool-age children for the results. They found that children are exposed to an average of four hours of screen time each weekday, with more than three and a half hours of exposure happening at home. The American Academy of Pediatrics recommends that parents limit combined screen time from television, DVDs, computers, and video games to two hours per day for preschool-age children. Researchers found that both kids who attend daycare and those who do not watched more television and played more video and computer games than the recommended two hours per day. However, children in home-based child care settings were found to have the most daily screen time. "A majority of children under the age of 5 years in the U.S. spend almost 40 hours a week with caregivers other than their parents, and it's important to understand what kind of screen time exposure children are getting with these other caregivers," said researcher Dr Pooja Tandon. Fathers should know that television viewing in young children has been associated with speech delays, aggressive behavior and obesity. Experts say although parents can curb screen time at home, it's important to ensure kids are not "vegging out" while away from home at daycare.